Dr. Brian Park wished some of his patients could have been present at the OHSU Diversity and Inclusion Awards this week. They weren’t there not because they didn’t want to, but because of various social and environmental factors that prevented them from attending – factors such as lack of access to child care, financial constraints and lack of access to mental health care. Helping patients overcome such odds and creating a culture of equity are what drives Park, M.D., M.P.H., and other nominees of this year’s OHSU Diversity and Inclusion Awards. 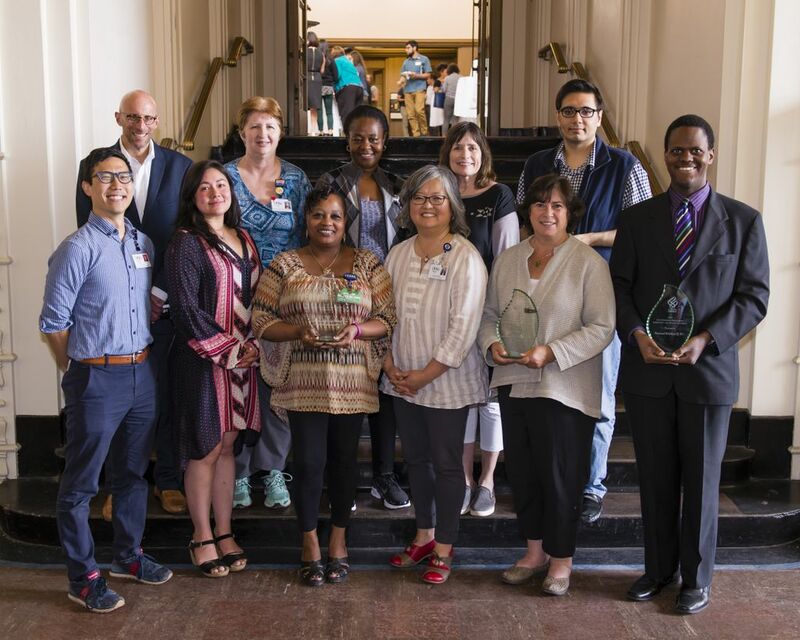 “This is work that everyone must get involved in,” Park said, as he accepted the award in the Champion Program category on behalf the Health Equity and Leadership at Richmond (HEAL-R) program. 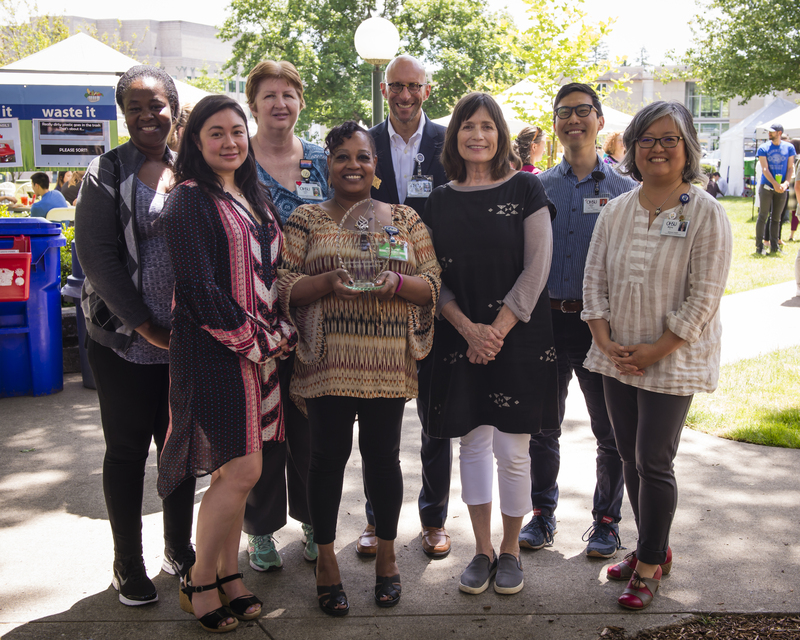 The June 12 event, held at OHSU, recognized staff and students for their outstanding contributions in the areas of diversity and inclusion. This year’s 31 nominees represent work throughout the state that impacts patients, employees and students. 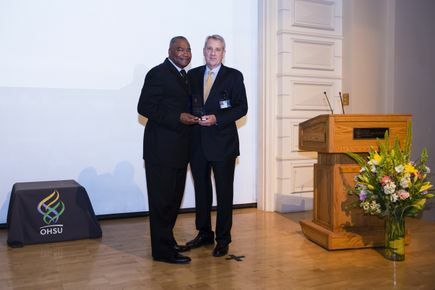 The Center for Diversity and Inclusion also presented a special Excellence in Diversity and Leadership Award to OHSU President Joe Robertson, M.D., M.B.A., for his countless years of exemplary service, leadership and commitment to the advancement of OHSU’s diversity, equity and inclusion efforts. 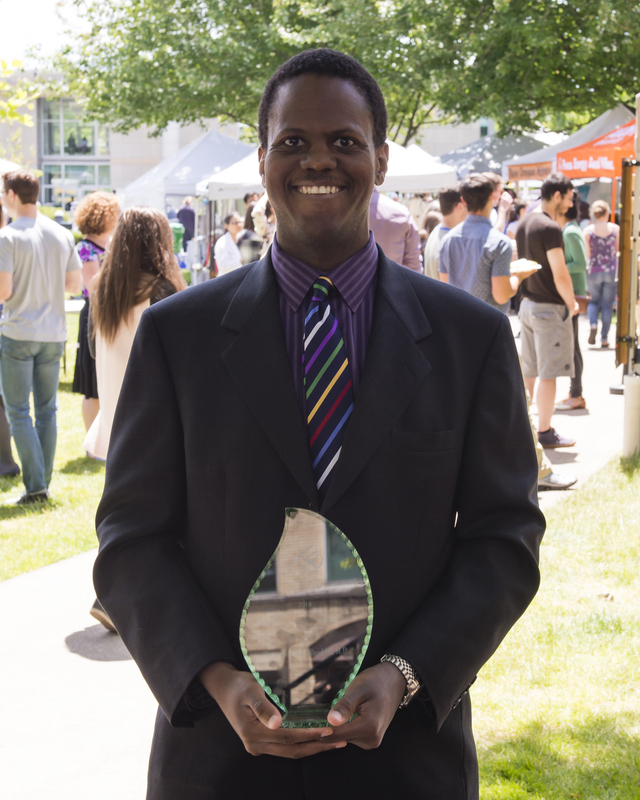 As he accepted the award, Robertson reiterated the institution’s goal to be a great organization that’s diverse in people and ideas. Shearwood “Woody” McClelland, M.D., received the Outstanding Researcher Award for his commitment to diversity, equity and inclusion in both patient care and research. His latest study, featured in Advances in Radiation Oncology, examines health disparities in cancer care through the lens of four patient populations: African-Americans, Native Americans, Hispanic-Americans and Appalachian-Americans. In his acceptance speech, McClelland shared that many people are often overlooked because of their race, gender or socio-economic status. He said his research hopes to bring optimal healthcare to as many people as possible. 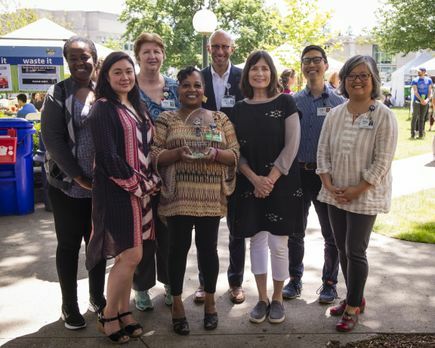 The Health Equity and Leadership at Richmond (HEAL-R) program received the Champion Program Award for contributions toward reducing health disparities and improving healthcare outcomes to diverse and under-served communities. The program empowers patients and community leaders to drive change. One patient wrote: “HEAL-R prescribed me a purpose. One year before I joined the team, I was living on the streets. This program gave me an opportunity to see myself as a leader and give back to the community so that no one else has to experience what I did.” HEAL-R is currently working with community organizations to raise $67 million for affordable housing in Portland. Joanne Noone, Ph.D., R.N., C.N.E., A.N.E.F. 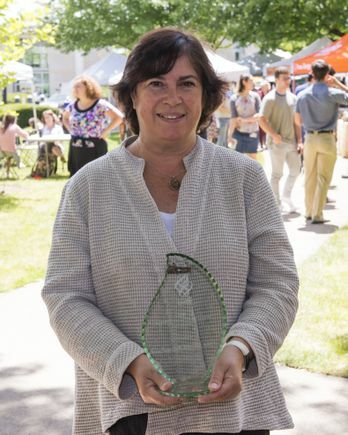 Joanne Noone, Ph.D., R.N., C.N.E., A.N.E.F., associate dean in the School of Nursing’s Ashland Campus, was awarded the Champion Individual Award for her work in addressing diversity and health-equity issues in southern Oregon and at the School of Nursing. She is the project manager for HealthE Steps, a program that seeks to improve health equity in communities and provides scholarships to students from underrepresented minority populations. The program increased the percentage of under-represented minorities on the Ashland campus by more than 32 percent. Noone serves as a board member on the Jackson County Public Health Advisory Board, as well as the Oregon Office of Equity and Inclusion Community Advisory Council. She is a founding member of the Southern Oregon Health Equity Coalition. 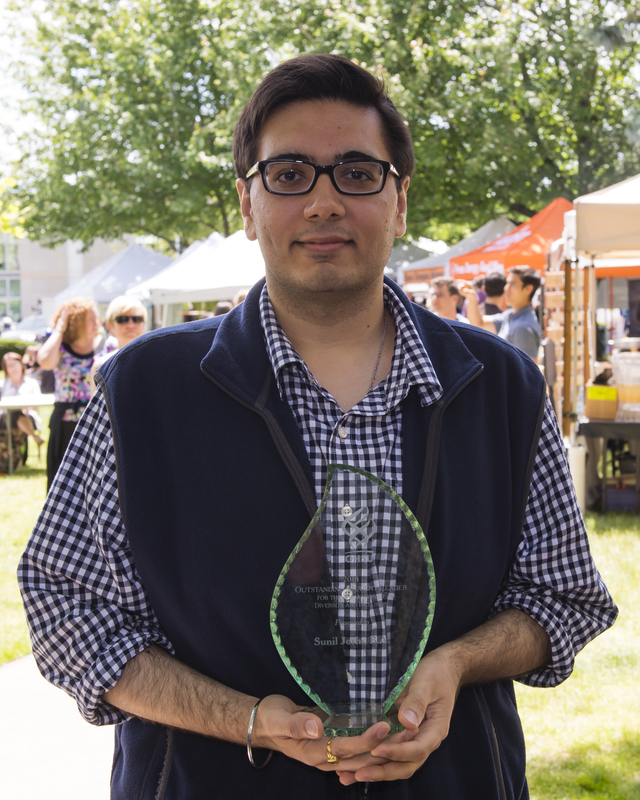 The Outstanding Student Leadership award was presented to Sunil Joshi, M.D./Ph.D. candidate, in the OHSU School of Medicine. As a past student leader on the Student National Medical Association at OHSU, Joshi was the principal organizer of the Minority Association for Pre-Med Students (MAPS). The organization assists pre-medical students from underserved backgrounds in pursuing post-baccalaureate studies in medicine. He also co-teaches a course through the OHSU/PSU NIH Build EXITO Program and serves on multiple OHSU committees to help enhance the curriculum. While working toward his Ph.D., Joshi was an early-career investigator for the American Society for Cancer Research. In this capacity he worked with congressional members, advocating for funding and opportunities for people from non-traditional, immigrant or underserved backgrounds.